According to the most recent America’s Charities Snapshot Report, employee volunteer programs are gaining popularity as nearly 60% of companies offer paid time off for employees to volunteer. The report also shows that 82% of the respondents say employees want the opportunity to volunteer with peers in a corporate-supported event. Employees are asking to volunteer, and companies are finding ways to reward employees for their participation through paid time off. All of this is paying off, as nearly 60% of employees who are proud of their company’s CSR programs are considered engaged at their jobs. Thus, employee volunteer programs are being directly linked to increasing employee engagement. 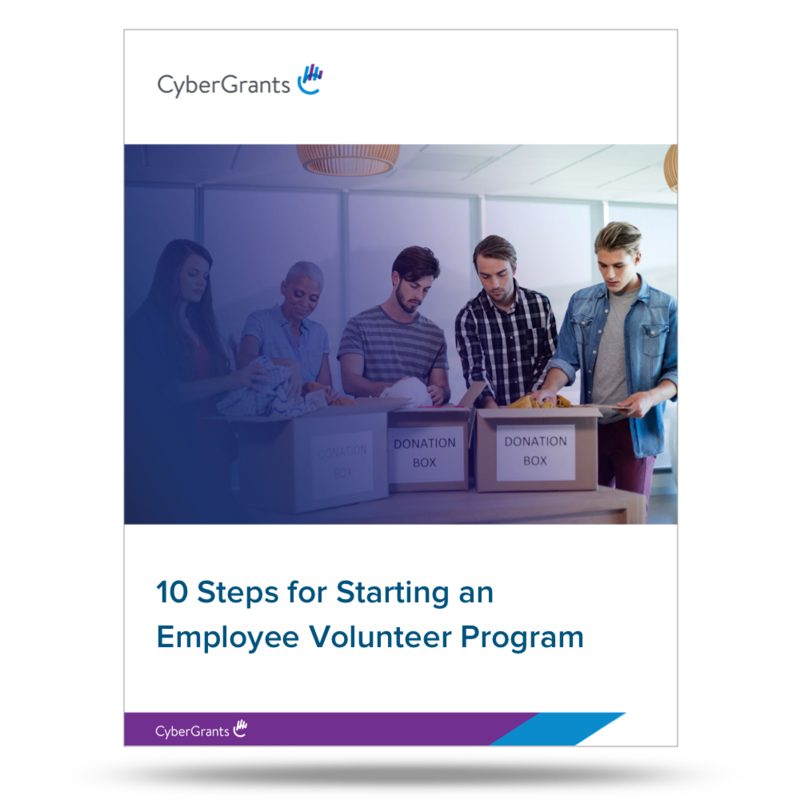 The benefits are endless, but there are many steps to getting an employee volunteer program started. Better yet, how do you keep one running for the long haul? We’ve pulled together employee volunteer program steps to use as a starting point for building your workplace volunteering program. Take a look! Step #1 - Define Your Focus to Align with Employee and Company Values? Your “why” should also align with the values of your company. For example, if your company seeks sustainability, then include volunteer opportunities that advance green initiatives. The company mission statement and business objectives are starting points to garner ideas for your employee volunteer program. Aligning the program to business objectives can also increase buy-in from company leaders. Devastation in the community around your location. Low engagement among your current workforce. Employee request to organize around a cause. To increase team-building in the organization. To counteract a public relations issue. You can see how each of these would have different outcomes, goals, measurements and unique challenges. For example, if engagement is already low among your employees, this might be an added concern or a place where you need support before you even start. Would anyone be willing to commit to time outside of work? Are your jobs flexible enough that paid volunteer hours are an option? Would people rather donate money than time? Would your executives be willing to offer incentives? Would your employees and volunteer leaders want to be recognized for their community service? What kind of volunteer work are your employees better suited toward? If your employees spend their days doing high level accounting, it might not going to be something they want to do during their volunteer time as well. If you want an employee volunteer program to last, you must set goals for it. Recent research has shown that setting specific and challenging goals leads to higher performance 90% of the time. Think about the value your volunteer program will add to your organization. Write down goals around corporate philanthropy, charitable giving and any pro bono work your company offers. Map these goals to total business outcomes. Work backward toward your goals to ensure they are both achievable and can be measured in the future. For instance, you may want each location in an area to contribute 4 hours per employee per year. In order to ensure that all employees have a chance to volunteer for those four hours, you’ll need to plan enough events during multiple shifts and in multiple parts of town in order to give everyone the opportunity to participate. Your goals should be granular and easy to hit when building an EVP that will scale. This will take careful research and a well-planned presentation to convince management and executives that an employee giving program is a good investment. Explain how volunteering helps attract and retain valued employees. 92% of Millennials believe business success should be measured by more than just profit. Community volunteering and donation-match programs illicit positive reactions from new talent, make your company stand out, and can be seen as signs of a successful company. Expound that corporate volunteerism is good PR. If your company needs to counteract bad publicity, or simply wants to increase brand awareness, a high-visibility volunteer project may help. Show how CSR software improves the organizational challenges your execs care about most. Identify the one person you need on your team to get buy-in and how to find and engage them in your plight. Gather research to show execs exactly how CSR software will affect your organization. Did you know volunteering program management software can help you engage leaders, thus engaging the rest of the workforce? CyberGrants Employee Engagement Platform allows program managers to tailor imagery, messaging and goals to resonate with specific employee audiences. The company’s image and bottom line will be improved by engaging in volunteerism. Volunteer projects increase team productivity and interdepartmental cooperation. Sharing a volunteer experience can shed light on productive interaction that carries over to the workplace. Social barriers and preconceived notions brought about by office politics are broken by interdepartmental team volunteer efforts. Volunteering builds and reveals skills. Seeing employees in a different setting can reveal leadership skills that you would not have otherwise seen. By demonstrating how specific departments will benefit from your EVP, the leaders of those departments are sure to give you the thumbs-up. No matter how well you’ve prepared, some people are going to object to an employee giving program. The important thing is to be fair and hear out anyone’s opinions. Assemble some statistics and reasoning (Did you know 76% of Millennials would even take a pay cut to work for a socially responsible company?) to combat their objections. Gather statements of support from respected stakeholders. Explain how the EVP will benefit both the employees and the company, and tell them why you wanted to do it in the first place. If they remain unconvinced, gather their feedback and utilize it to improve your program offerings or processes. Send out a quick survey to get a pulse on what’s driving the employees to participate and what they look to get out of the program. Do a quick audit of the plan you’re building to make sure it aligns with employees’ expectations. Offering variety in projects, times and locations can help keep volunteers engaged rather than making lists in their heads of things that need to be rescheduled or delegated while they are out of the office. Ensure people aren’t getting involved for the wrong reasons. Your employee volunteer program shouldn’t just be about accruing extra personal hours, it should mean something to each individual who participates. Team feedback is essential: find out what’s important to everyone, and situate the program around their needs. Digital content - You can publish blog articles, social media posts, landing pages and even host all of the information on your careers site in an employee benefits section. Email campaigns - Set up internal email campaigns to deliver the information to employees, help them get enrolled and show them how your new program will work and the benefits for providing one. Make program managers available - You can set up open office hours and invite employees to stop by to learn more about the new program. Provide coffee and snacks, host a luncheon or throw together an out-of-office happy hour event - whatever fits your culture most. The point is to kick off the program with a bang and get the workforce excited about this new initiative while making the leaders of the program known across the company so employees know who to turn to for questions and concerns. Once your program is up and running, you may want to step back and celebrate. Don’t relax for too long, because there’s more work to be done. Your program may be successful at first, but it doesn’t exist in a vacuum. Make it a habit to publicize outcomes when a volunteer project is complete. Share photos and interview employees on how a volunteering opportunity affected them personally and professionally. Showcasing employees who have participated in your program is important in exciting employees to start or continue volunteering and can further infuse its importance in the company culture. For more information, check out our post Company Values: Integrating Them Into Your Culture. How helpful was your involvement for the supported non-profit or cause? What was accomplished? Did the volunteer opportunity support the company’s mission and business objectives? How were the employees impacted by their time spent volunteering? What did they learn about the cause, your company, their coworkers and themselves? Reviewing EVP goals regularly ensures you are asking volunteers to do what is needed most, now. Comparing post-volunteering surveys to those completed at the initiation of the program can demonstrate the impact employee giving has on your coworkers by finding out if they’re happier, more productive or more likely to stay at the company. Corporate philanthropy software can also track and measure all of your workplace volunteering data like the amount of employees who participate, hours contributed, amount of paid time off given and more! Learn more about this software here. Creating and managing an employee volunteer program is difficult, but far from impossible. With these tips, you’re well on your way to making your company—and the world—a better place. Ready to get on board and make employee volunteer programs a breeze to manage? Learn how CyberGrants’ integrated, cloud-based corporate philanthropy platform can work for you.